WinAmp DSP_Plugin (nun auch als Standalone- und Kommandozeilen Programm!) für Soundoptimierungen. Stereoverbreiterung, Low + High Pass etc. ¹ If these features are enabled on the free (non-registered) version, a message ('This sound is processed by Stereo Tool') is played once every 12 hours - if both FM processing and Loudness are used every 4 hours. This should not interfere with most non-commercial usage. ¹ Although most options of Stereo Tool are free, some options that enable FM radio stations to sound louder than their competitors, as well as some options that enable broadcasting in stereo and adding RDS texts to the broadcast without using extra hardware are limited in the free version of Stereo Tool. Intended for Winamp, SAM Broadcaster, RadioBOSS and other applications that support Winamp DSP plug-ins. Sound card input to sound card output. Intended mainly for FM radio stations which process external (live) feeds. (Not an installer - right-click and save) Processes .WAV or raw PCM data. Same as the command line version, but for Linux. Command line version for Linux with GUI. Note: The VST plugin version of Stereo Tool is not free. Zuletzt geändert von ^L^ am 20.01.19, 16:58, insgesamt 20-mal geändert. and other applications that support Winamp DSP plug-ins. (Not an installer - right-click and save) Processes .WAV or raw PCM data. Useful if you want to use Stereo Tool in a script. See the bottom of this page for a short explaination. - Composite limiter added. Gives about 7% (0.5 dB) extra loudness on FM transmitters, without affecting the FM Pilot and RDS signals. - 6% performance improvement. This version is now faster than any previous version. (Not an installer - right-click and save)	Processes .WAV or raw PCM data. Useful if you want to use Stereo Tool in a script. The command line version can be used as a stand-alone application from the command line. (Right click and use Save As...). input.wav is an existing 16-bit uncompressed stereo WAV (or raw audio) file, - for piped input. output.wav is a 16-bit uncompressed stereo WAV (or raw audio) file, - for piped output. settings.sts is the full absolute path to an STS (Stereo Tool Settings) file. Type stereo_tool at the command line for more information. - Added new stereo widening filter: Stereo Boost. - Updated most of the presets to use the new Stereo Boost filter. - Reduced the minimum value for the gap detection time. - Bug fix: No audio problem unless 'bypass' is used solved. - Bug fix: Too long delay in tray icon volume display solved. - Improved Hard Compression: Dance presets. - Bug fix: Under certain circumstances occasional hangups could occur. That should be solved now. - Single core systems were not properly recognized and used code that was optimized for multicore systems. The CPU load on single core systems should be slightly lower now. Re: Stereo Tool 4.22 -> Equalizer Limiter Azimuth etc. 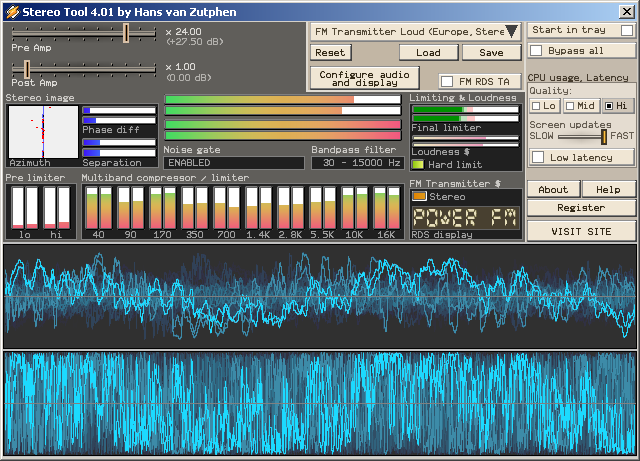 Stereo Tool 4.22 (October 2009). BTW: Lt. History-Seite ist eine grundlegend überarbeitete Version 5.00 in Arbeit. Loudness: Added yet another filter ("Very deep bass distortion protection") to reduce bass distortion and make the total sound cleaner. Loudness: Now bypassing Punch for frequencies below 45 Hz for cleaner output sound. Loudness: Improved handling of female voices and xylophone-on-top-of-low-strings sounds, leading also to an overall more natural sound. Re-organized Loudness window. Should be clearer now. Stereo Boost: Added a filter that removes excessive reverb that occurs in some songs. The result is much closer to the original sound, but still with strongly increased stereo. UPDATE: Stereo Tool 6.10 -> Equalizer Limiter Azimuth etc. Inzwischen zahlreiche Optimierungen, neue Funktionen, LINUX Version usw. Stereo Tool 7.50 ist aktuell. potentially also in other versions depending on what CPU is used. SST: New licensing mechanism added. Bug fix: SST web interface was allocating too much memory on the stack which could lead to stack overflows (stack is only 64 kB). Bug fix: Stokkemask Use area set to 0 caused crashes (value was out of range, but one preset used it). Bug fix: Some information was continuously rewritten when Low Quality monitoring was enabled. MicroMPX: Rate control could act up due to clock jumps caused by a bug in Visual Studio. Workaround added. Selecting the same Kernel Streaming sound card twice caused weird issues in Windows -> now detected before opening. libVLC 3 now also supported for streaming (libVLC 2 also still works). libVLC restarting issue when watchdog was enabled fixed. GUI: Some streaming output settings were inadvertently hidden if not in Expert mode. Linux: Added Generic version with no X11 dependencies. Bug fix: R128 could crash on 32 bit Linux. Bug fix: Generic plugin: GetScope function needed a refresh call to determine what to show. Bug fix: 9.10 32 bit VST version didn't run on Windows XP anymore. Bug fix: RDS: UECP TMC data DSN/PSN filtering added. RDS: EON channel selection added. Advanced Clipper: There could be a bump around 3 kHz, fixed, also slightly more natural sound. MicroMPX: Resampling margins slightly increased - a small offset in the pilot is better than dropouts. WatchCat: Lots of improvements. More stable, easier to use, better looking interface.